In loving memory of our founder and mentor, Leonard L. Loeb, who passed away on March 9, 2003, we celebrate his life and his practice of law. His ideology continues to guide us. 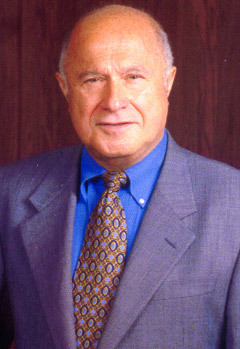 As of 2003, Leonard Loeb had been practicing law for 51 years. A 1952 UW-Madison Law School graduate, he began his law career in the Air Force Judge Advocate General Corps. Raised in Columbus, WI, Leonard’s heart never left the “country.” In fact, at the time of his death, he was still farming nearly 300 acres across four different farms in the Lodi, Juneau, Oconomowoc and Helenville areas; including a tree farm with 250,000 plantings. In order to minimize conflict and consistent with the concept of equity, the vast majority (more than 96%) of Leonard’s cases over 30 years of practicing family law exclusively were resolved through a negotiated settlement. Leonard’s family law practice was guided by a symbolic principle: he endeavored to preserve the ability of divorcing parents to someday dance at their children’s weddings. Careful negotiation, attention to the needs of his clients, and the minimization of conflict were the essential means to this end. Leonard built the firm of Loeb & Herman, S.C., upon the principle that children are the most precious assets in a marriage and should be the most protected asset during a divorce. No child generally wins when their parents divorce. Endeavoring to mitigate children’s losses during this critical time while finding the best solution for his client was Leonard’s priority. That said, from 1973 on, Leonard’s expertise in negotiation resulted in his never having to try a custody case. Leonard’s legacy continues to this day in the form of various legal and philanthropic recognitions, including the Leonard L. Loeb Society of Jewish Scholars, American Association of Matrimonial Lawyers Leonard L. Loeb Scholarship and the State Bar of Wisconsin’s Leonard L. Loeb Senior Lawyers Division Award.